Check out the full infographic at the bottom of this story. In fact, the three metropolitan areas, no more than a five-hour drive apart, account for the vast majority of major motion picture production in Ohio, Michigan and the Western Pennsylvania region - well beyond 500 feature films in the last three decades. Those films include Hollywood blockbusters like Marvel’s The Avengers, The Dark Knight Rises, Transformers and the soon-to-be filmed Man of Steel 2: Superman vs. Batman. 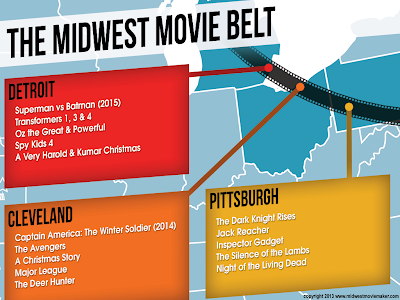 In short, the region is the Midwest’s one-and-only Movie Belt. It’s giving the rest of the nation a true run for its big budget money. And it’s offering film professionals a chance to settle down and build a successful career right at home. 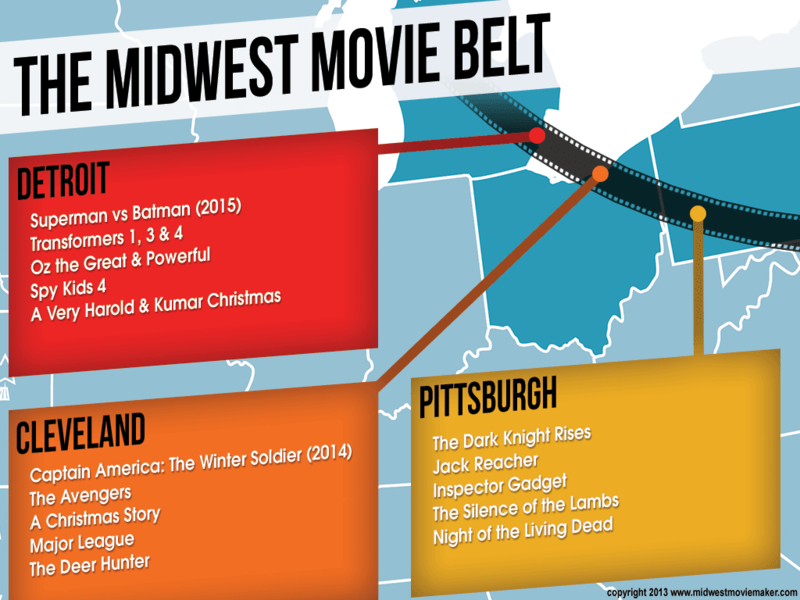 Arguably, the Midwest’s Movie Belt is catching up to California and New York as one of the busiest hubs for movie making in the U.S. A quick example. Only four feature films shot in and around Chicago in 2012, according to the Chicago Film Office’s website. In the Movie Belt? Nearly 30. It’ll take work for the region to surpass states like Georgia and Louisiana. According to the Filmworks website, Louisiana was home to 118 feature film and television projects in 2010. Georgia, more than 50. And with 40 states now offering film incentives, the competition is only growing stronger. But the Movie Belt has a lot to offer filmmakers. And it all starts with unique architecture and easy accessibility to varied topography within a short drive of downtown, says Ivan Schwarz, director of the Cleveland Film Commission. The same goes for Pittsburgh and Detroit. Jessica Conner, assistant director of the Pittsburgh Film Office, touts the Steel City as a modern ‘burg with several culturally diverse surrounding boroughs. Accessibility is a perk for productions in Detroit, too. While each city has doubled for the likes of New York City, Washington, D.C., Gotham City, Chicago, and Moscow, among many other locations, Schwarz, Conner and Begnoche agree that this flexibility and accessibility will never be the foundation for building a successful industry in the Belt. And as the saying goes, size doesn’t matter. 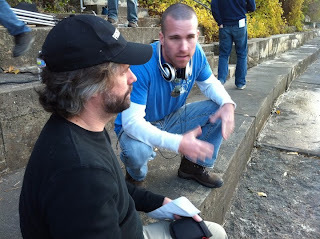 Some film productions require a fair amount of hand-holding, while others require nothing at all. Unique locations and strong customer service is appealing to every film production. But the hard truth is shooting on location is an expensive and complex logistical endeavor. Producers must transport crew and equipment, house and feed crew and cast, secure rights to shoot on location, control crowds, divert traffic, deal with changes in weather and local governmental opinion - the list goes on and on. In short, the pros of shooting on location somewhere in the Movie Belt (or anywhere else for that matter) are often overshadowed by the cons. So it’s imperative that states that want to attract film production and build a sustainable entertainment industry for the long-term provide some incentive for producers to opt for location shooting. More often than not, the incentive that makes the difference is a financial one. And while most think of a film incentive as a tax break for filmmakers, today’s film incentive varies not only from state-to-state, but in structure, type, and size as well. Tax credits and exemptions are often included, but other incentive programs might include cash grants, fee-free locations or other perks. “Without our film incentive, we wouldn’t be having this conversation,” says Schwarz. The Ohio Film Tax Credit provides for a refundable credit against the corporation franchise or income tax for motion pictures produced in Ohio. The tax credit is equal to 25% of non-wage and nonresident wage Ohio production expenditures and 35% of Ohio resident wage production expenditures. Up to $5 million in credits is available per production. Pennsylvania offers a 25% transferable tax credit for any production spending a minimum 60% of their budget on qualified expenses in the Commonwealth. And Michigan offers an incentive of up to 35% for qualified expenditures, including Michigan hires and money spent on goods and services in the state. There is a minimum spend of at least $100,000 per project to qualify, and approval must be made before expenditures can qualify. Film incentives have generated $100 million in revenue for four years running in southwestern Pennsylvania, and in the current fiscal year Michigan has awarded incentives to 28 projects projected to spend nearly $139 million in the state. The majority of the projects will film in Detroit and the metro Detroit region. Schwarz compares the Movie Belt’s burgeoning film industry to the region’s traditional industries - automotive and manufacturing. In their heyday, those industries fueled economic growth by supporting ancillary businesses that in turn strengthened the industry - tool and die shops that supplied the automakers with parts, for example. All the way down to supermarkets and shops in the neighborhoods where employees bought homes and raised families. “What we do isn’t just about ‘the movies’,” says Schwarz. “It’s about building the infrastructure that will support the industry. We want and need to nurture the growth of vendors and services that will support, form and become a part of the industry. 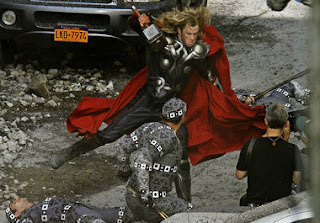 That industry includes production work outside the film and television world. All three cities are focused on growing their digital media and video gaming production base, as well. With similar goals, comparable challenges and close proximity to one another, one might wonder if the Detroit, Cleveland and Pittsburgh film commissions might ally with one another to drive even more business to the region. Unfortunately, differing governmental structures and state regulations prevent anything official from happening. That doesn’t mean communication is non-existent between the groups. 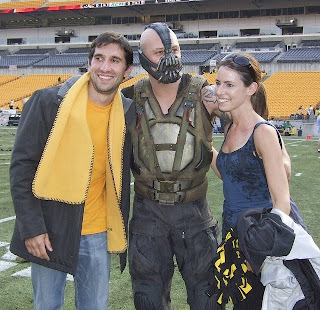 And as with all things Detroit, Cleveland and Pittsburgh, there’s always a bit of good-natured rivalry. Schwarz circles back, underscoring the importance of relationship building and customer service. Borders may separate each film office, but they don’t keep film professionals from working in and around all three cities. Sustaining a freelance career as a production assistant, makeup artist or grip was next to impossible 20 years ago, but today it’s entirely possible. Only five hours by car separates Detroit and Pittsburgh. And the film professional who calls Cleveland home can get to either city in about two hours.